Life on the Hay Farm: For me? I couldn't possibly accept...and my 1st ever giveaway! For me? I couldn't possibly accept...and my 1st ever giveaway! Congratulations Amy! Email me your physical address and I'll mail your new books to you! Amy from Keeping up with the Schultz Family has very graciously given me this award. Thank you, Amy! This award is supposed to be passed on to 8 bloggers. But I know so many more great blogs than that! If you are reading this, consider yourself rewarded! Leave me a comment, take your award, and pass it along as often as you like! "They came to Texas to make their family whole. They fought for the land they'd come to love. An unforgettable saga of faith, love, and loyalty that will find it's place deep in your heart.In the days when Texas was the northern edge of Mexico, when Bowie and Houston and Crockett were men not yet legends, when the Alamo was still a scruffy mission on the banks of the San Antonio River, this unorthodox family struggled to make a wild but beautiful land their own.This is the tale of Jerusalem Ann, who is willing to take whatever life dishes out in order to make a life for her family. It's the story of Clay, who finds himself protecting another man's family-and in love with another man's wife. It's about Jake, who loves two women and can't do right by either... and Julie, who'd rather be free than respectable...and Bowie, who can handle war but might not survive his first love. 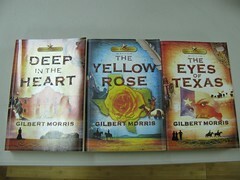 It's the story of Comanches and fiestas, hunting parties and courting parties, of battles and massacres and beautiful calm nights under a canopy of stars.Wide as the prairies, warm as a San Antonio breeze, spiced with adventure and romance, this Texas-sized saga of faith from a beloved storyteller will quickly find its place deep in your heart...and never let you go." Doesn't that sound delicious? The characters are great and I love all the history that's interwoven as well. 1.Leave me a comment telling me what your favorite genre(s) of book is.2. Grab my badge and post it on your blog, then leave a comment telling me you did.3. Follow me and be my friend! (Be sure to leave a comment telling me you did!)4. Post about this giveaway on your blog with a link back and I'll give you 3 more entries! The giveaway starts now and will end Wednesday night at midnight (central time). I'll use random integer to pick the winner! That's it! I hope that's not too much to ask. I thoroughly enjoyed this series and would love to pass them along! I follow you and I am a friend for sure. I like all kinds of books. Like romance, a bio, mystery and so on. I read just about anything. I love this book you are sharing because I am from Texas..